Adobe will no longer develop its mobile Flash app, though it will continue to support it for Android users. 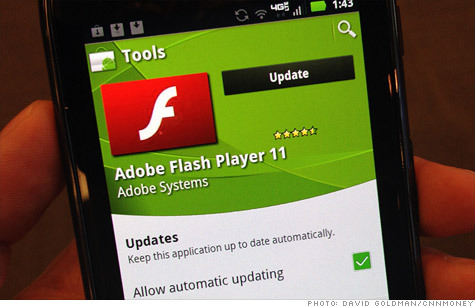 NEW YORK (CNNMoney) -- Adobe is abandoning its Flash software for mobile devices. Don't panic: For consumers, this is a good move. Adobe is moving away from its 15-year-old technology to instead embrace a universal standard for displaying rich media on the Web. Shifting to HTML5 -- the new, broadly accepted Web standard -- is a bold move for Adobe. Many smartphone and tablet owners, particularly those with iPhones and iPads, have not been able to view media coded for Flash on their mobile devices. Flash is a type of software called "middleware," an add-on extension to the browser that allows rich content like video and games to be viewed. HTML5, by contrast, allows developers to embed that content right into a website without the need for middleware. That means video and geolocation services can be baked in. HTML5 has the added benefit of allowing content to be viewed offline. In April last year, Apple (AAPL, Fortune 500)'s then-CEO Steve Jobs ranted about Flash on Apple's website, saying the software is "closed and proprietary, has major technical drawbacks, and doesn't support touch-based devices." He said iPhones and iPads would never support Flash because "new open standards created in the mobile era, such as HTML5, will win on mobile devices (and PCs too)." He suggested that Adobe (ADBE) focus on creating HTML5 tools instead of Flash. A year and a half later, Adobe appears to have admitted that Jobs was right. "HTML5 is now universally supported on major mobile devices, in some cases exclusively," wrote Danny Winokur, Adobe's general manager of interactive development, in a blog post on Wednesday. "This makes HTML5 the best solution for creating and deploying content in the browser across mobile platforms." As a result, Adobe plans to stop developing its Flash app for Google (GOOG, Fortune 500) Android and Research In Motion (RIMM) BlackBerry Playbook devices -- the two mobile platforms it developed for -- though it will continue to support them and update them with bug fixes. As part of its move, Adobe said late Tuesday that it is laying off 750 members its staff. Though many have portrayed Adobe's move as a win for Steve Jobs and Apple, it's a shift analysts say was inevitable. Flash was always destined to eventually be replaced by something better. "Eating your own children is standard operating procedure for successful tech companies," said Al Hilwa, analyst at IDC. "HTML5 is coming on strong as a standard. In this light, having a large cadre of staff working on putting Flash on every mobile device on the planet appears to be unnecessary and an unwise use of resources. Adobe is smart to let go." Websites have been gradually moving away from Flash as a rapidly growing number of users browse the Web on their smartphones and tablets. Adobe likes to point out that nearly 75% of online video is encoded in Flash. But many of those videos are also encoded in other video formats like H.264, which can be played right in an HTML5-enabled browser. By 2013, IDC predicts that 90% of smartphones and tablets will have HTML5-capable browsers. Reading the handwriting on the wall, Adobe has been encouraging its developers to use its development tools like Adobe Air to make HTML5 websites and applications for mobile devices. The move probably won't hurt Adobe financially: Adobe doesn't make money when Flash videos are viewed or when Flash games are played. Instead, the company monetizes Flash by selling its development apps, such as Air and Creative Suite. If Adobe can convince customers to use Air for HTML5 development, then it won't lose a beat. In fact, HTML5 is such a new standard that Adobe's move on Wednesday gives the company an opportunity to become the industry leader in HTML5 development tools. That's not to say that Flash is completely dead. Adobe said that it will continue to develop Flash for the PC for "advanced gaming and premium video," including 3D graphics. Still, for consumers, we may finally be one step closer to viewing the same videos, games and apps on any device, on any software platform, in any browser.